This tutorial is designed to provide an introduction to molecular dynamics simulations with Amber. It is designed around AMBER Tools v14 and assumes that you have not used Linux or Amber before. It is designed for new users who want to learn about how to run Molecular Dynamics simulations. It does however assume that you have a machine with AmberTools v15, VMD and xmgrace correctly installed. AMBER stands for Assisted Model Building and Energy Refinement. It refers not only to the molecular dynamics programs, but also a set of force fields that describe the potential energy function and parameters of the interactions of biomolecules. 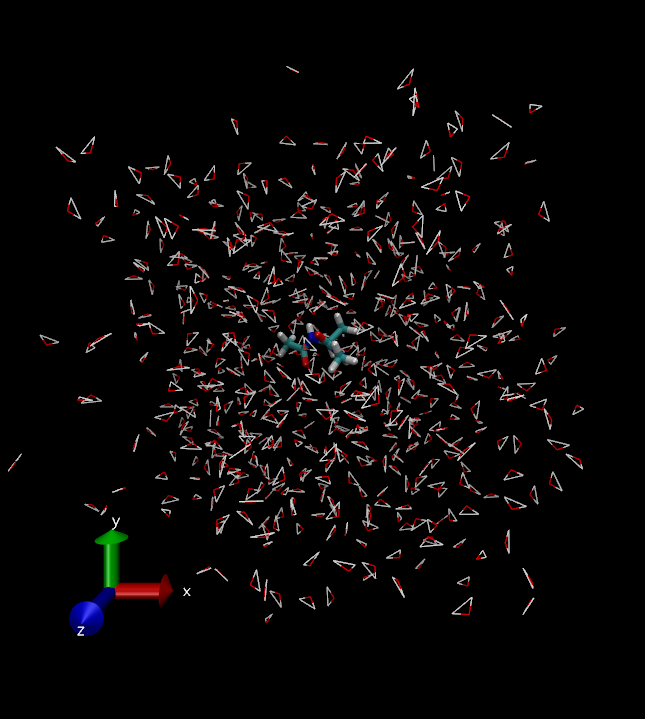 In order to run a Molecular Dynamics simulation in Amber, each molecule's interactions are described by a molecular force field. The force field has specific parameters defined for each molecule. sander is the basic MD engine of Amber. pmemd is the high performance implementation of the MD engine that contains a subset of features of sander. pmemd can also be run with acceleration from graphics processing units (GPU). Amber MD is software that is entirely based on a Command Line Interface (CLI) on a computer with Linux. To run Amber, you will need to open a terminal. 1. Open a terminal now on your Linux computer. Most of the work for this tutorial will be done mainly through the terminal. 2. Use the ls command to list what is in your current directory. 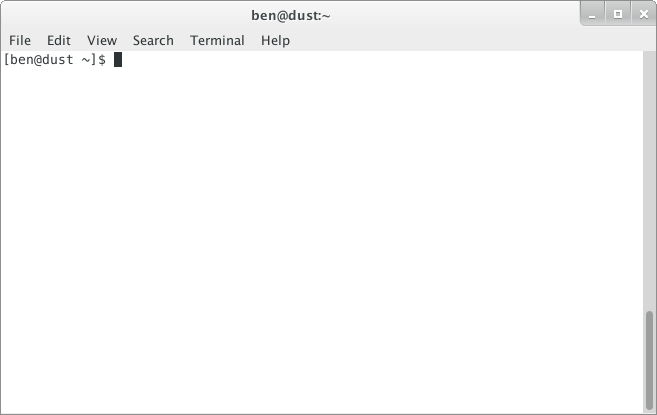 Note that the "$" is the command line prompt in the terminal. At this point there will probably be some files and directories in your home directory that are created automatically with your account. You'll need a new directory for the files and folders created in this tutorial. 3. Make a new directory for this tutorial with the mkdir command called Tutorial. Now when you do ls you should see your new directory has been created. At this point, you'll want to move into your Tutorial directory so that you can save all of your working files there. 4. Use the cd command to change to different directory. There is a special directory named "..". This means the parent of the current directory. So to return to the parent of the Tutorial directory use cd .. If you ever need to return to your home directory use just the cd command by itself. Tilde "~" is a shortcut to your home directory. The following commands both change directory to your home directory. Pathnames describe what directory you are in relative to the entire computer's filesystem. You home directory has location within the entire filesystem. 5. Print the working directory pathname of your home directory with pwd. This is the current working directory that you're located in. In this case the directory username is in the directory home which is in the / (root) directory. For this tutorial, you will build the following molecule in the preparatory program called xLEaP for simulation in AMBER. In order to build and solvate this molecule, you will need to start xLEaP. xLEaP has another command line interface and simple molecular graphics for building the system topology and define parameters for the molecules. 6. Start xLEaP now with the xleap command. -I: Adding /usr/local/amber_14/amber/dat/leap/prep to search path. -I: Adding /usr/local/amber_14/amber/dat/leap/lib to search path. -I: Adding /usr/local/amber_14/amber/dat/leap/parm to search path. -I: Adding /usr/local/amber_14/amber/dat/leap/cmd to search path. Do NOT click the "X" on any LEaP window. It will quit LEaP entirely. At this point it's a good idea to turn Num Lock off for the menus to work. A MD force field is the the Hamiltonian (potential energy function) and the related parameters that describe the intra- and intermolecular interactions between the molecules in the system. In MD, the Hamiltonian is integrated to describe the forces and velocities of the molecules. 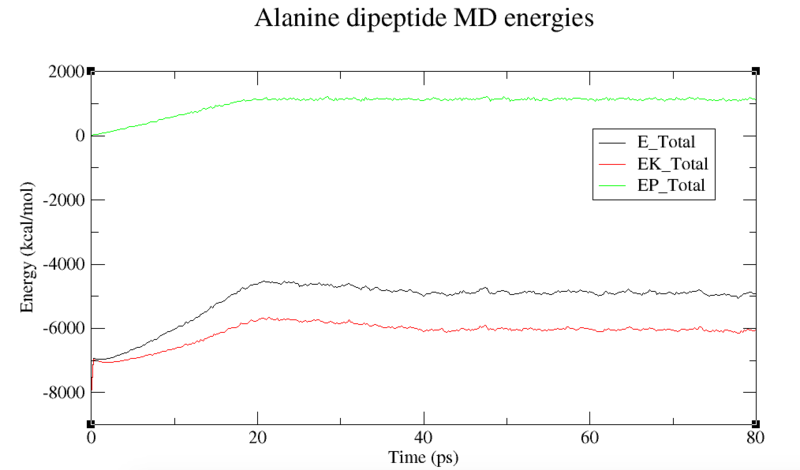 In order to run a molecular dynamics simulation, we need to load a force field to describe the potential energy of alanine dipeptide. We will use the AMBER force field FF14SB for proteins and nucleic acids. FF14SB is based off FF12SB, an updated version of FF99SB, which in turn was based on the original Amber Cornell et al (1995) [ff94] force field. The most significant changes to the FF14SB force field included updated torsion terms for the protein Phi-Psi angles and refits of the torsion terms for side chains. Together these improved the estimation of alpha helices in these molecules. 7. source (load) the FF14SB force field now. 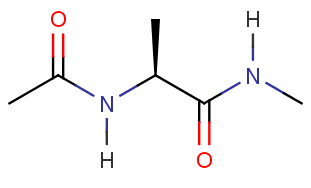 We can build an alanine dipeptide as an alanine amino acid capped with an acetyl group on the N-terminus and n-methylamide on the C-terminus. After we loaded the force field ff14SB, xLEaP now has these "units" available to build into a molecule. The sequence command will create a new unit from the available units and connect them together. 8. Use sequence to create a new unit called foo out of the ACE, ALA, and NME units. 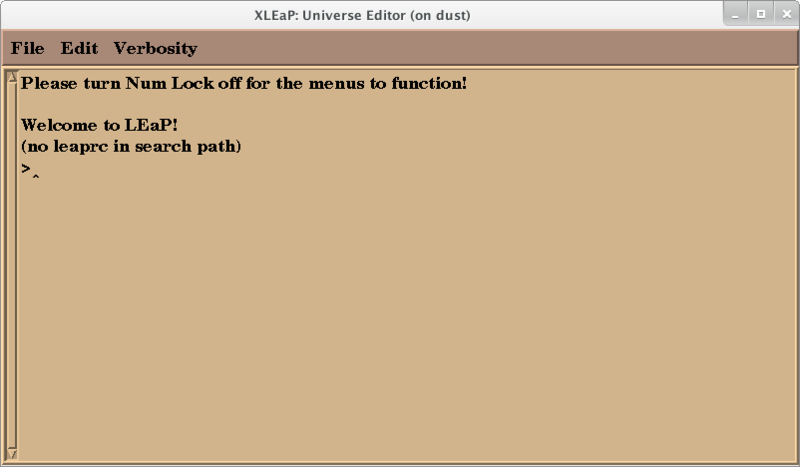 Note that the ">" indicates the command line in xLEaP. Now you have a single alanine dipeptide molecule stored in the unit foo. xLEaP provides a very basic editor to examine and change units and molecules. 9. 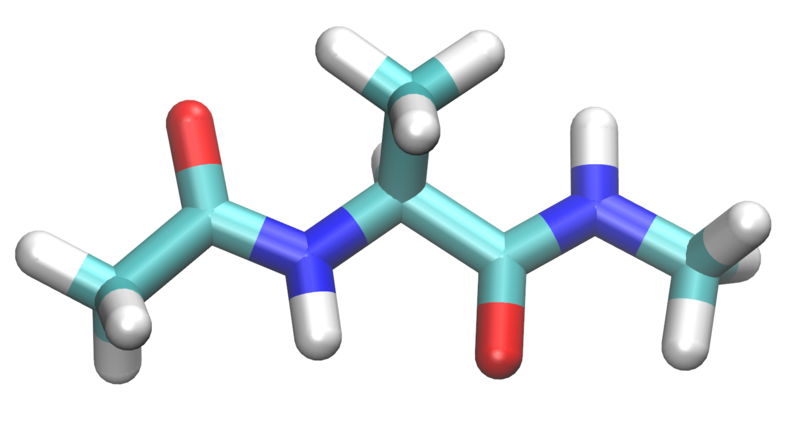 Examine the structure of the alanine dipeptide molecule. Use the edit command to view the structure. From here, you can examine the topology, structure, atom names, atom types, and partial charges of the molecule. 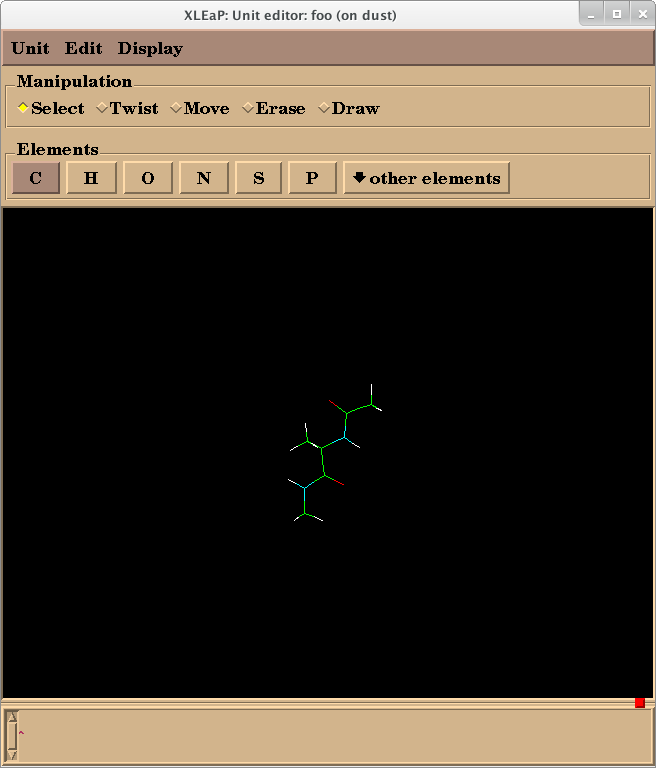 Basic editing of the molecule is also possible. Do NOT click the "X" to close this window. It will exit xLEaP. To close this window, use Unit -> Close. The next step to prepare this alanine dipeptide system is to solvate the molecule with explicit water molecules. In this simulation we will use add TIP3P water molecules to the system. In this type of simulation, the system has periodic boundary conditions, meaning that molecules that exit one side of the system will wrap to the other side of the system. It is important that the periodic box is large enough, i.e. there is enough water surrounding alanine dipeptide, so that the alanine dipeptide molecule does not interact with its periodic images. There are many water models available for MD simulations. However, for this tutorial we will use the TIP3P water model for this simulation. 10. Solvate the system with the solvatebox command. TIP3PBOX specifies the type of water box to solvate with. 10.0 indicates that the molecule should have a buffer of at least 10 Angstroms between alanine dipeptide and the periodic box wall. Now we will save the parm7 and rst7 files to the current working directory. The unit foo now contains the alanine dipeptide molecule, water molecules, and the periodic box information necessary for simulation. The parameters will be assigned from the ff99SB force field. 11. To save the parm7 and rst7 file use the saveamberparm command. Pay close attention to the output of this command for any warnings or errors that your parm7 and rst7 file did not build correctly. 12. To quit xLEaP use quit. The last components needed are the input files that define the program settings for each MD run. For this system, we will perform an energy minimization on the system, then slowly heat the system, and then do production MD at the desired temperature and pressure. We will save the trajectory and write to the output file every 2ps. The Langevin thermostat will be used to control the temperature. The random number generator will be initialized with a random seed. To control all these settings, we will write a simple input file in a text editor. Linux has many text editors available, but we will use a simple text editor included on your linux computer. 13. 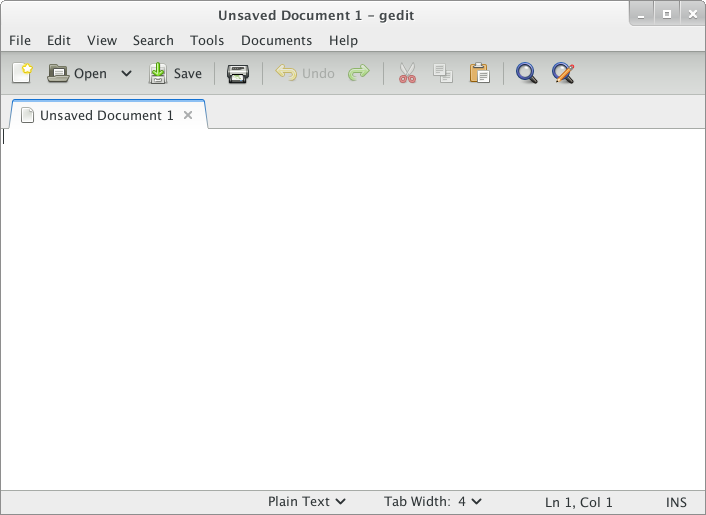 Open the gedit Text Editor on your Linux computer. The final three lines allow the thermostat to change its target temperature throughout the simulation. For the first 9000 steps, the temperature will increase from 0K to 300K. For steps 9001 to 10000, the temperature will remain at 300K. By itself, this input file is not intended for general MD simulations. NTPR and NTWX are set very low so that it is possible to analyze this short simulation. Using these settings for longer MD simulations will create very large output and trajectory files and will be slower than regular MD. For real production MD, you'll need to increase NTPR and NTWX. The production time of this simulation is only 60ps. Ideally, we would run this simulation for much longer, but in the interest of time for this tutorial, we have limited the production simulation time. Now that we have all the ingredients: the parameter and topology file parm7, the coordinate file rst7, and the input files 01_Min.in, 02_Heat.in, 03_Prod.in, we are ready to run the actual minimization, heating, and production MD. To do this, we will use the program sander, the general purpose MD engine of Amber (there is also a high performance version, termed pmemd, which is part of the commercial version of AMBER and the optimum choice of MD engine but for purposes of the tutorial sander will suffice). sander is run from the command line. On the command line, we can specify several more options and choose which files are to be used for input. 17. First, from the terminal, you will need to change directories to the Tutorial directory with all of your input files. "~" is a shortcut to your home directory where you created a Tutorial directory. 18. Run the minimization of alanine dipeptide with sander. sander should complete the minimization in a moderate amount of time (~ 27 seconds) depending on your computer specifications. After sander completes, there should be an output file 01_Min.out, a restart file 01_Min.ncrst, and a MD info file 01_Min.mdinfo. You will use the restart file 01_Min.ncrst for the heating of the system. 19. Using gedit, open the outputr file 01_Min.out. In the 01_Min.out file, you will find the details of your minimization. You should be able to see the system energy ENERGY decrease throughout the minimization. Now, using the restart file from the initial minimization, we will heat the system. 20. 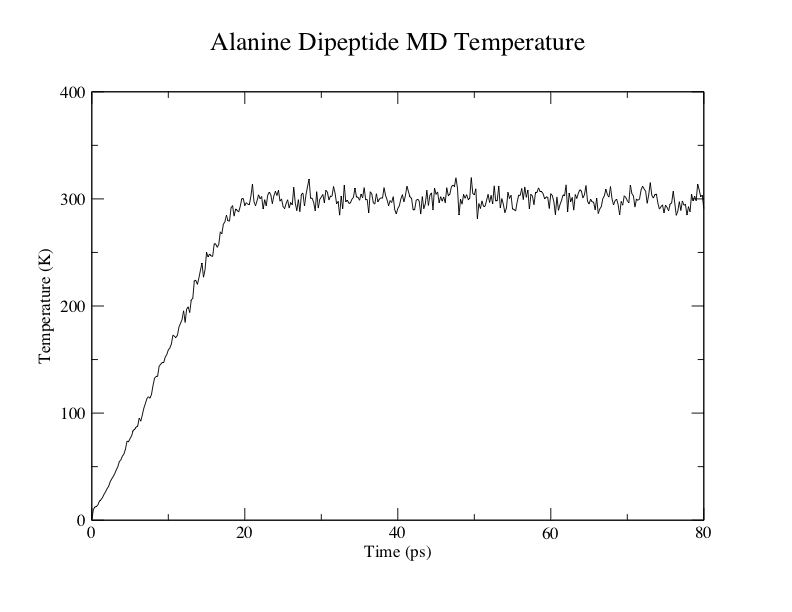 Run the heating of alanine dipeptide with sander. sander should complete the heating in a moderate amount of time (~ 2.5 mins) depending on your computer specifications. The heating output files are available here. Some files are compressed and need to be unzipped. 21. Open the output file 02_Heat.out to view the system output. Note that the pressure is 0.0 because the barostat (pressure control) is not being used in the heating. Now that minimization and heating are complete. We move on to the actual production MD. 22. Run the production MD of alanine dipeptide with sander. Now sander is running in the background. It will take some time to run the production MD. But we'd like to monitor the status of the production MD. So we will monitor the sander output file to check the status of the run. The Linux program tail will print the end of the output file. 23. To monitor the status of this job use the program tail to print the output file to the terminal. This prints the output file as sander is running. It's useful to keep track of the job. You can also monitor the mdinfo file (cat 03_Prod.info) which provides detailed performance data as well as estimated time to completion. 24. To exit tail, quit the program by pressing <CTRL-C>. Let the MD simulation run. It should take a while to complete the simulation [~ 10 minutes]. Once it's complete open the output file to check that the simulation completed normally. 25. Open the output file 03_Prod.out with gedit to view the output of the MD simulation. You've now run an MD simulation. 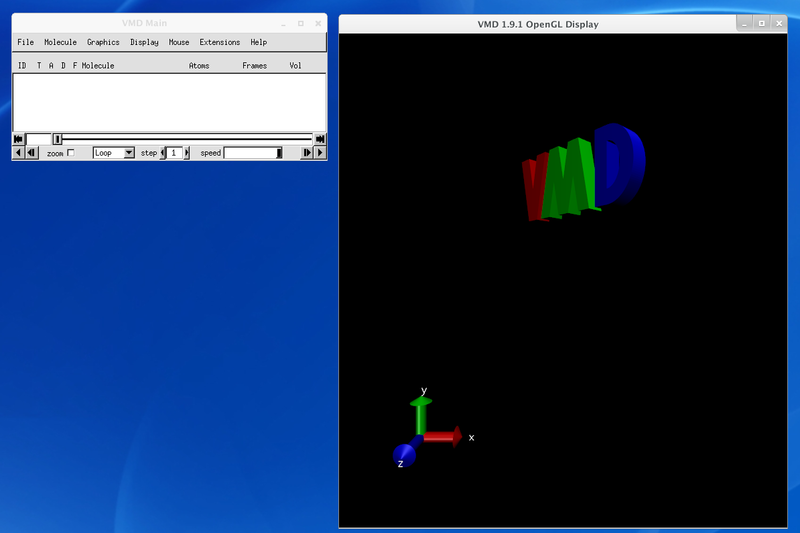 In order to visualize the results, we will now use a program called VMD (Visual Molecular Dynamics). 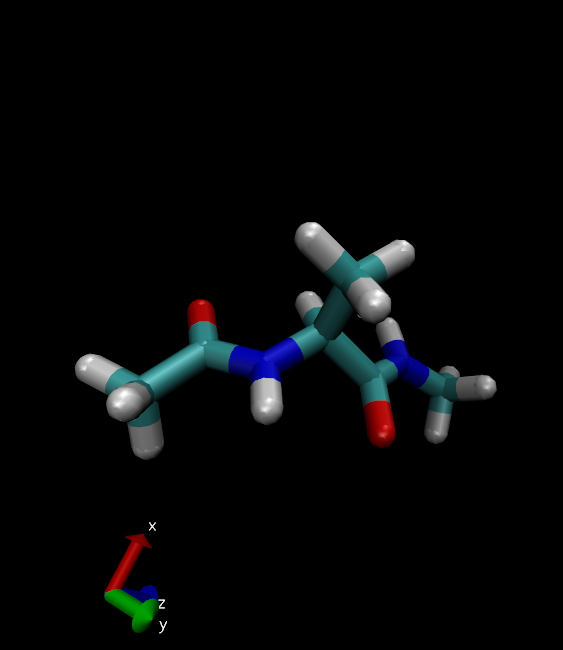 This is a molecular graphics program that can render molecular structures in 3D. VMD not only loads Protein Database (PDB) structure files, but also MD trajectories from many programs. [A more in-depth tutorial on VMD is available as an optional hands-on session listed at the bottom of the workshop program page]. 26. To start VMD, open a terminal, change directory to your tutorial files in the Tutorial directory, and run vmd. Remember ~/Tutorial is a shortcut to your Tutorial directory. VMD is a very useful tool to visualize protein, nucleic acid, and other biomolecular atomic structures. One of the most common formats is the PDB biomolecular structure format. To load a PDB, got to File -> New Molecule.... Then load files for a New Molecule and choose the PDB file. VMD should determine the file type Automatically. 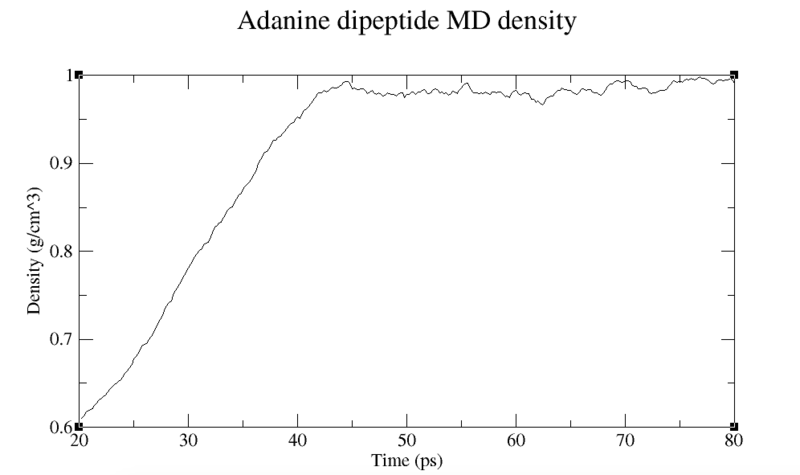 However, we would like to visualize the alanine dipeptide trajectory. 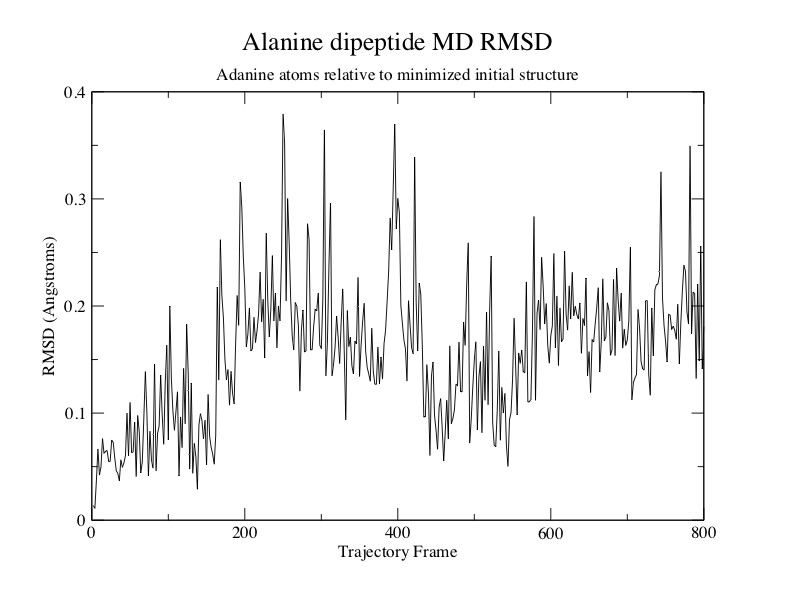 Now we will load our MD trajectory to look at the dynamics of alanine dipeptide. 28. Load files for New Molecule. Then choose the Amber parameter and topology file parm7. Set the file type to AMBER7 Parm. Click Load. 29. Load files for 0: parm7. Then choose the Amber trajectory file 03_Prod.nc. Set the file type to NetCDF (AMBER, MMTK). Click Load. VMD now loads your trajectory to be visualized. The main VMD window can be used to control playback. You should be able to see the alanine dipeptide molecule as well as the many water molecules in the display. You can rotate, zoom and pan the molecules around the display with the mouse. Many different visualization options can be changed in the Graphics -> Representations window. Your visualization can be restricted to the alanine dipeptide as well. 30. Change the Selected Atoms to all not water. You can change the drawing method for the molecule to a more interesting model. 31. Change the Drawing Method to Licorice. VMD has a lot of functions that can be used to analyze and study a MD trajectory. For example it is possible to align molecules, measure root mean squared deviations (RMSD), save structures from a trajectory, and measure physical system parameters throughout a trajectory. It's also possible to render a movie of a trajectory. However, these functions are beyond the scope of this introductory section. For more details refer to the VMD tutorial on the main AMBER Tutorial page. Amber includes a suite of tools to examine and analyze MD trajectories. In this tutorial, we will do a simple analysis with several Amber programs and plot the results. The analysis will primarily be done from the command line in the terminal. 32. Open a terminal and change directory to your tutorial files. 33. Make an Analysis directory and change to that directory. Now we will use an analysis script process_mdout.perl to analyze the MD output files. This script will extract the energies, temperature, pressure, density, and volume from the MD output files and save them to individual data files. It is now quite simple to plot the data saved in the output files. We will use a convenient, simple plotting program called xmgrace to automatically generate plots for the following MD simulation properties throughout the simulation. We use this for our convenvience, but you can use any plotting program of your choice. MD simulation total, potential, and kinetic energies. However, for the MD simulation density, the heating portion of the simulation does not include a density output. You will need to edit the summary.DENSITY file to remove the empty data points for xmgrace to work. 35. Use gedit to edit the summary.DENSITY file to remove the empty data points (up to 20ps). 36. Plot these properties through the simulation using the following commands. We should run this simulation much longer so that the density has equilibrated and the simulation converges. However, in the interest of time for this tutorial, the production MD simulation time has been set very low so that it possible to analyze the results. Here you can see the linear increase in temperature during heating (0-20ns). This is followed by the relatively stable temperature fluctuations about 300 K during the production simulation. During the 20-80ps, the density equilibrates to approximately 1 g/cm^3. This corresponds to a change in periodic box dimensions as the density of the system converges. This plot shows the total system energy which can be decomposed to the total potential energy and the total kinetic energy. The root mean squared deviation (RMSD) value is a measurement of how similar a structure's internal atomic coordinates are relative to some reference molecule coordinates. For this example, we will measure how the internal atomic coordinates change relative to the minimized structure. Specifically, we will analyze the alanine atoms (residue 2). To do this analysis, we will use cpptraj, a fairly comprehensive analysis program for processing MD trajectories. This program runs simple user-written scripts that choose what trajectories to load, what analysis to run, and what processed trajectories or structure to save. First, we will need to write a simple cpptraj script to do this analysis. 37. Use gedit to create a cpptraj script called rmsd.cpptraj. To actually run cpptraj, we must run it again from the terminal in the directory where the parm7, nc, and reference ncrst file is located. 38. Using the terminal, change directory to your Tutorial folder, and run cpptraj. A parm7 file and cpptraj script must be specified. Now our RMSD data is stored in the file 02_03.rms. We can simply plot this file with xmgrace. 39. Plot the RMSD with xmgrace. In this example, there is no significant conformational change in the n the Phi/Psi dihedral angles in the alanine dipeptide. This indicates a more stable peptide structure. Congratulations. You've now run your first complete MD simulation and successfully analyzed the results. This is a fairly simple example of the workflow for setting up, running, and analyzing your own MD simulation. If you want to learn more you are encouraged to complete the additional tutorials on the AMBER website.